Projects Chair let me know. Be sure to let your members know about our talent, scrapbooking, essay, oratorical, and other contests! They are all a lot of fun and a great way to showcase your club’s strengths. ICON this year will be held in Chicago, Illinois. 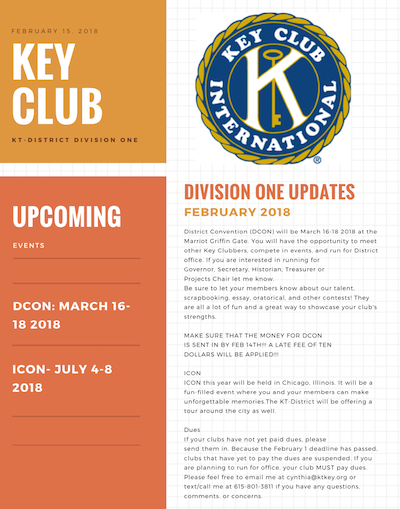 It will be a fun-filled event where you and your members can make unforgettable memories.The KT-District will be offering a tour around the city as well. send them in. Because the February 1 deadline has passed, clubs that have yet to pay the dues are suspended. If you are planning to run for office, your club MUST pay dues. Please feel free to email me at cynthia@ktkey.org or text/call me at 615-801-3811 if you have any questions, comments, or concerns.